A bonus chapter only available online here at Falconquinn.com!!! In Falcon Quinn and the Black Mirror, Falcon, Pearl, Megan, Destynee, and Jonny Frankenstein head out into the castle one night in order to try to retrieve Quimby, their head-in-a-jar, who has managed to escape his “crystal” and is now floating like a helium balloon toward the Tower of Souls. They’re also in search of Lincoln Pugh, a young were-bear, who has transformed into his terrible bear form and is now wandering around the castle. 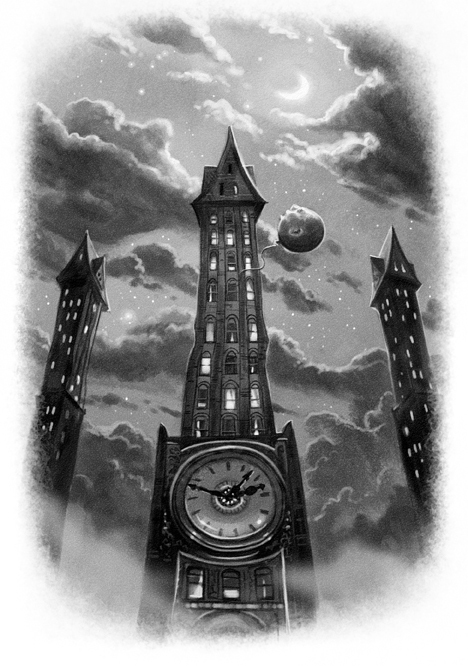 In the published version of Falcon Quinn, we only follow the adventure of Falcon and Megan, as they ascend the Tower of Souls and enter its mysterious clockworks. Later, when they’re re-united with Pearl, Destynee and Jonny, their three friends refuse to discuss what happened to them in the Tower of Science, where they searched for Lincoln Pugh; they only state that something terrible happened to them in the tower, in a room called Chamber X.
Pearl, Destynee, and Jonny climbed up the stairs toward the Tower of Science. This staircase, unlike the one in the Tower of Aberrations, was lit with flickering torches, mounted on the wall. The circular stair brought them to a small landing with three doors, all three of them clawed by the wear-bears paws.. The door to the left was marked BRAIN RESEARCH & STORAGE; the one in the middle THE B FLAT ROOM, and the third REGENERATION LABORATORY. “Let’s split up,” said Jonny. “I’ll check out the Lab,” said Jonny. “I’ll take—B flat Room, I guess,” said Destynee. one of the doors before them. 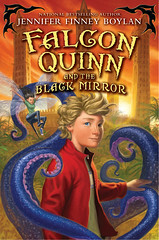 Falcon Quinn is a new series from HarperCollins books about a young man who finds himself turning into a monster. Falcon and his friends find themselves taken to the Academy for Monsters, where they're taught how to imitate human beings, and thus survive in the world. Raising the question: What's the right thing to do-- to imitate something you're not, in order to survive? Or to embrace your true self, if your true self is, say, a zombie? The series is written by national bestselling author Jennifer Finney Boylan, and the artwork is by legendary book illustrator Brandon Dorman.